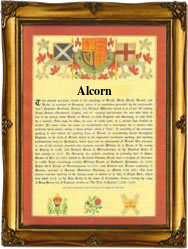 Although Alcorn is generally accepted today as a Scottish name, it is believed to have originally come from Alchorn, a manor in the parish of Rotherfield, Sussex. The component elements in this locational name are "Al(d)ca", an Olde English pre 7th Century personal name, plus the Olde English "horn", literally meaning "horn", but used here in a transferred sense to describe a projecting spur of a hill; hence "Alca's hill". In his "Patronymica Britannica", Lower states that a family bearing the name Alchorne lived in Rotherfield in the 14th Century, however the earliest recording of the surname is in Scotland (see below). The variant spellings Aldcorn and Aldcorne appear on record in Stirling in 1448 and 1476 respectively. On September 16th 1540, Margery, daughter of Thomas Allchorn, was christened in Rotherfield, and on January 8th 1692, Susannah Alcorn was christened in St. Paul's, Covent Garden, Westminster, London. Elizabeth Alcorn and Richard Pierce were married in Friston, Sussex, on March 23rd 1723. The first recorded spelling of the family name is shown to be that of John Awldcorn, which was dated 1446, in the "Leasing Records of the Mill of Kethyk", Scotland, during the reign of King James 11 of Scotland, 1437 - 1460. Surnames became necessary when governments introduced personal taxation. In England this was known as Poll Tax. Throughout the centuries, surnames in every country have continued to "develop" often leading to astonishing variants of the original spelling.